With all the Olympic events a few weeks ago, it got me thinking about success and how it is defined. Sure, we talk about gold, silver and bronze medals and the athletes who win them, but is a medal the ultimate symbol of success? Does a gold medal mean that you had more success than the silver medalist? Does simply being on the podium suggest that you are more of a champion? Consider the various regattas your team has entered. At some, there is little to no competition and your team easily walks away with a medal. Everyone takes photos of themselves with their medals, celebrating their achievements because there is tangible evidence of the win. Yet at other races, the competition is so stiff your team is elated to have finished in the top 10. There might be considerably less photos taken because, well, how do you document that achievement in a photo? But at which race would you consider your team more successful? Which makes you feel as if your hard work has been rewarded? Think about the various athletes on your team. For some, athleticism comes naturally. They have been engaging in some sort of athletic endeavor since childhood and are accustomed to the kinesthetic rigors of sports. Others have only recently found themselves pursuing athletic activities. For them fitness, conditioning and flexibility may be much more of a struggle. What one paddler may take for granted in terms of coordination or endurance, another may have had to really fight for. If both are on the race roster, who has had more success in getting there? I recently read about 2016 Olympian runner Nikki Hamblin who helped Abbey D’Agostino cross the finish line after the two were involved in a mid-race collision in which D’Agostino fell and clipped Hamblin. Helping D’Agostino to her feet, Hamblin encouraged her by saying, “We have to finish!” Hamblin was awarded the rare Olympic Fair Play award that has only been handed out 17 times in Olympic History. Although Hamblin was not on the podium, is she not successful? Consider the periodic fitness testing or other type of testing your team may take part in. Most of us aren’t overjoyed at the idea of fitness testing, though we all realize it’s important as a way to document our progress and strengthen our team as a whole. We all get nervous. We all wish it could be over sooner. And in the end we get ranked or somehow ordered. But as a list of numbers, does that list give any insight as to what each person has endured to get where they are? Not long ago, I watched a teammate celebrate her first pull up. Others on the team can do 20 or 30 or likely even more. Who is more successful at that moment? The answer is certainly arguable. The thing about success, in my mind, is that we will never truly know the path that a person or team has taken to get where they are. The major television broadcasting companies aren’t exactly waiting in line to interview dragon boaters to find out what they’ve had to overcome to get where they are. Sure, we see stories about the Olympic athletes, and the media loves to highlight the unusual or extreme biographies such as the 2016 summer Olympic stars who have conquered adversity: US gymnast Simone Biles, refugee swimmer Yusra Mardini, or Brazilian judo star Rafaela Silva. But what if we each had to write our own story? Or our team’s story? 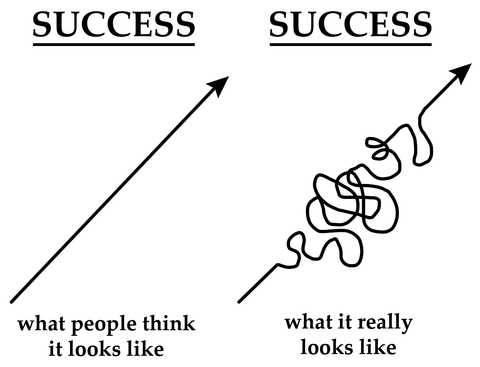 What would be illustrated as your path to success? What struggles would be highlighted? I’m sure you’ve seen the diagram below. It’s so very true, but if the path didn’t look like that twisted and windy road, would we just take it for granted? Would we even call the end result a “success”? If it were direct and easy, maybe it would be just another task accomplished without much thought. 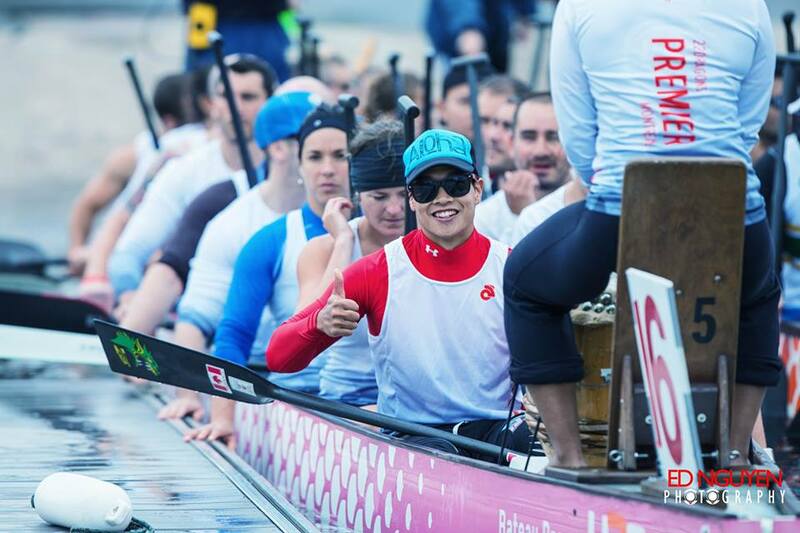 Think about the personal development you have seen in yourself as an individual paddler. Be completely honest with yourself. What level of effort have you put towards your training and what progress have you experienced thus far as a result? What are your ambitions or intentions as a paddler? How far have you come and how far are you looking to go? How do you feel about your position within the team? Being near the bottom of the pack gives you quite a lot to strive for and can certainly be a nice motivation to work harder if your goal is to stay on the team or be on the race crew. Being closer to the top of the crew can sometimes backfire because you might see no reason to strive for improvement if the rest of the team isn’t perceived as putting in the effort to advance. And now consider your team as a whole. Whether your team has taken the route of being competitive or all-inclusive, the team’s successes and failures cannot be defined solely in terms of medals. How far has your team come in terms of growth? What goals did your team achieve last year? What goals have you set for this year? So, whether you’re contemplating your own successes or those of your team, it’s important that your determination isn’t based purely on medals or your personal ranking on the team. Your path towards improvement is a crucial component of your overall success. Don’t discount the journey.